Melbourne Rectangular Stadium is an sports stadium located on Edwin Flack Field on the Olympic Boulevard in the Sports and Entertainment precinct of Melbourne, Australia. Known as AAMI Park for sponsorship reasons, the stadium is home to two A-League teams, Melbourne Victory and Melbourne City FC in addition to no less than three rugby teams. Melbourne Rectangular Stadium first opened in 2010 becoming the city’s first purpose built stadium for sports which weren’t suited to the oval shaped pitches commonly used in both Cricket and Aussie Rules football. The exciting new facilities replaced the old Olympic Park Stadium which whilst rectangular in shape was actually a re-purposed athletics venue complete with running track around the perimeter of the pitch. 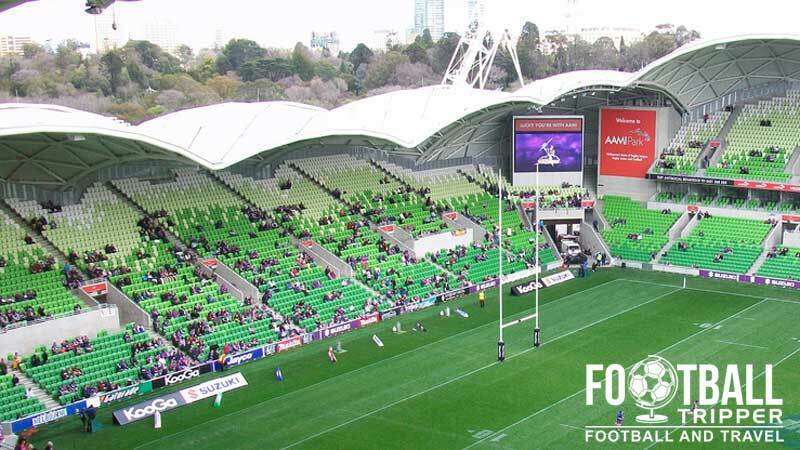 With the older facility only capable of seating 11,000 out of its total 18,500 capacity the Victorian Government sought a state of the art ground in order to create a Super Rugby Team for the city of Melbourne and in 2004 launched a feasibility study assessing the economic, environmental and social impact of such a project. After losing the bid for a Super Rugby Team the local council adjusted their plans in 2006 and decided to proceed with the creation of the new stadium to be used primarily for National Rugby League and A-League fixtures. After unveiling plans for the 30,000 capacity ground which was capable of expanding to 50,000 if necessary, the city won the bid to have the 15th Super Rugby League license and the city finally got the franchise they wanted. bourne based clubs play each other. 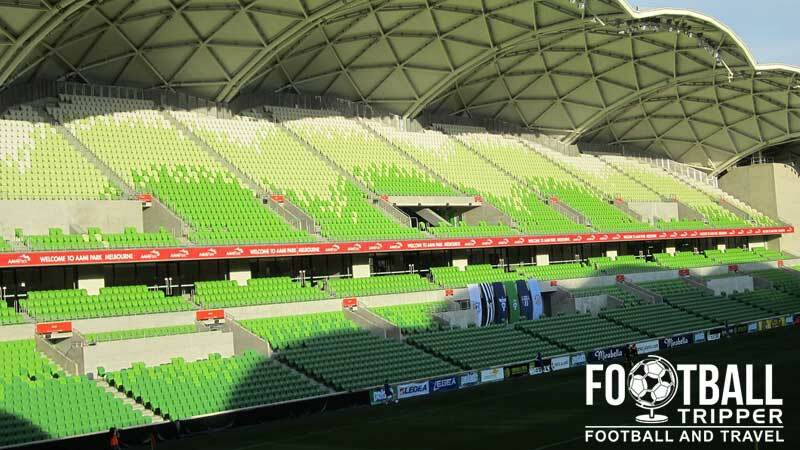 Lastly, the stadium is known officially as the AAMI Park after the Government of Victoria agreed an 8 year sponsorship deal with the insurance firm on the 16th March 2010. The non-sponsorship name remains as Melbourne Rectangular Stadium. Melbourne Rectangular Stadium consists of the following four stands: North, East, South and West. 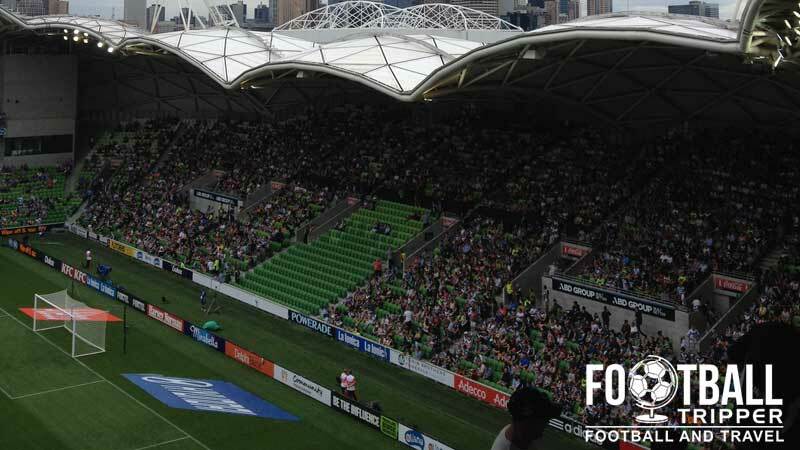 Bays 16-18 are usually reserved for the club’s most vociferous supporters, and it is from this section of AAMI Park that a lot of the atmosphere is generated from on matchdays. Fans usually stand here throughout the match, and bring in large banners and flags which can sometimes obstruct views. 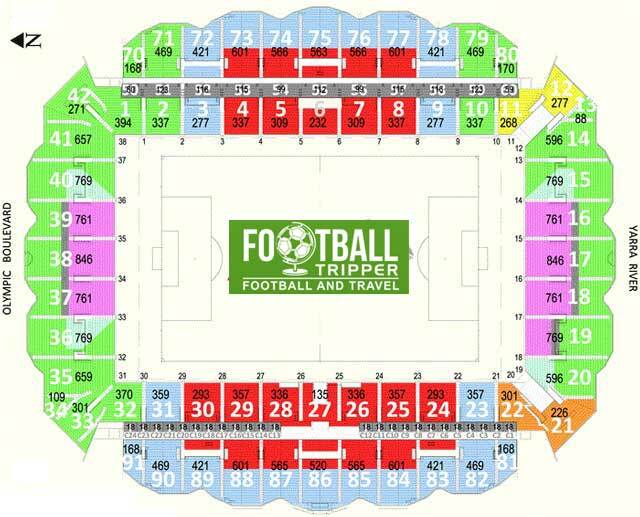 Away fans are usually housed within sections 32 and 33 which is tucked right in the north-west corner. Depends on where your starting point is within the city there are a good number of places to drink around the Olympic Park Sports Complex. East of the ground on Swann Street which turns into Olympic Boulevard there is the likes of the Cricketers Arms, Holliava, and Bar 9T4 amongst other potential pubs. North-west of the park within the city centre there are hundreds of potential places to drink including joints such as The Irish Times Pub, The Bull & Bear Tavern, Young and Jackons, and the Woolshed Pub which overlooks Victoria Harbour. Inside The rectangular stadium beer is of course also on sale. The food situation is similar to the pubs in the sense that there are some options on Swann Street and Wellington Parade, however the bulk of the restaurants are to be found within the city centre with everything covered from Indian to Mexican, and from Thai to Vegetarian. Fast food staples around Flinders Street which are available include the likes of McDonald’s, Subway, Nandos and Hungry Jack’s (Burger King). Currently there’s no permanent club shop located at AAMI Park with the merchandise kiosks around the ground only in use on match days and special events only. If you wish to purchase Melbourne City FC goods in the meantime you can always visit the official online shop which is open 24 hours a day, 7 days a week. Melbourne City F.C are currently don’t allow fans to undertake a tour of The Rectangular Stadium as there is no official tour program. If this changes we’ll be sure to update this section. From the concourse inside the stadium you can just about make out the roof’s dimples. 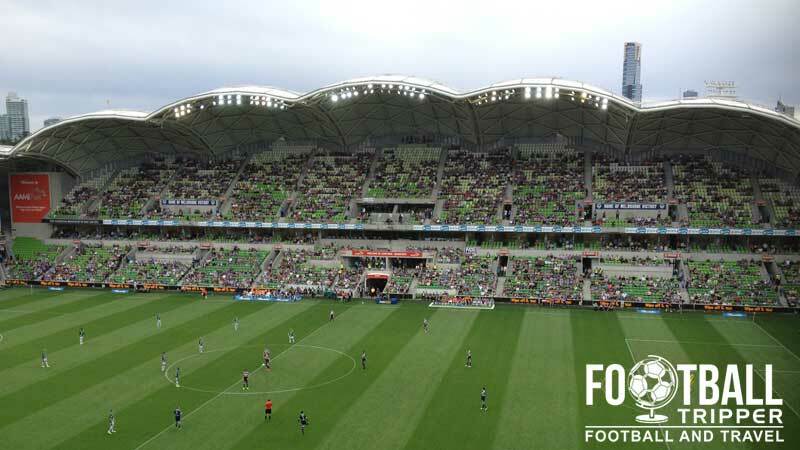 Tickets to see Melbourne City play at AAMI Park can often vary in price depending on levels of demand, and whereabouts you sit so don’t be surprised if the prices appear to fluctuate by a few dollars per fixture. The best place to compare them is on Ticketek which is the official ticket merchant of the club. This refers to seating located behind either goal-end. This is the four blocks of seating either way of the half-way line. This is any other seating within either stand which runs for the length of the pitch. Please note that the above ticket prices are illustrative for the 2015 season and don’t include booking fee ($4.50) and payment processing fee for some credit cards. AAMI Stadium is located within Melbourne & Olympic Parks which is collectively known as the sports and entertainment precinct. The Rectangular soccer stadium is just one of the many sporting facilities located in the nearby area. The bobbly exterior of AAMI Stadium as seen from across the road at dusk. Parking is very limited on matchdays, however there are a number of spaces that you can pre-book up to 24 hours before the game begins. It costs $30.00 on the day, $20.00 when pre-booked, and $7.50 when there are no events at the sports complex. Fans are advised to travel to the ground early, and to use public transport if possible. For more information, to explore a full range of car-parks and to book official parking please visit this page. Richmond Station is located 650m east of AAMI Park, and can be walked by most fans in no more than 10 minutes. The journey along Swan Street and Olympic Boulevard really allows you to appreciate the stadium for afar as well as soak up the pre-match atmosphere. Services run from the following places: Lilydale, Belgrave, Alamenin, Glen Waverley, Frankston, Cranbourne/Pakenham and Sandringham. There are two tram services which can be taken to get to AAMI Park. Tram 70 (Wattle Park) – Services depart from both Flinders Street and Richmond Station with the nearest stop being 7D – AAMI Park which is on Olympic Boulevard. Trams 48 (North Balwyn) and 75 (Vermont South) – Stops on Wellington Parade which is the northernmost point of the sports complex just passed Melbourne Cricket Ground. Tram 70 will take you two minutes to walk to the stadium, Trams 48/75 will take you around seven minutes. Which one you should take depends on where you are coming from in Melbourne. Melbourne City were originally known as Melbourne Heart and played primarily in red until they were taken over by Manchester City in 2014. The logo was redesigned and the use of red was relegated to the away kits only. AAMI Park is served by Bus 605 which travels through Exhibition Street, the brilliantly named Batman Avenue, and Olympic Avenue which used to be known as Swan Street. There is a taxi-rank which operates on matchdays just outside of The Oval on Olympic Boulevard which is around two minutes north of the AAMI Stadium. If you want something even fancier to remember your day out at the football then you can even book a water taxi. What a country! Located close to the heart of Melbourne there are numerous hotels within a 15 minute radius of the stadium, with most options locate north-west of the ground from Batman Avenue. Here there is the likes of a Hotel Ibis, Travelodge and DoubleTree by Hilton Hotels.